As you lie on top of the RumbleRoller, its flexible thumb-like bumps penetrate your tight muscles, gradually restoring their proper function and releasing built-up pain. 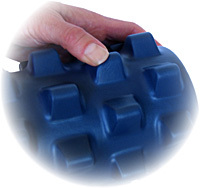 Or use RumbleRoller's new Beastie series massage tools to dig even deeper into your chronically troublesome spots. Regardless of whether you're a conditioned athlete or a sedentary office worker, you're likely to experience muscular tightness in your back, neck, or legs. If you can't afford the time and cost of professional massage therapy, RumbleRoller products are your best self-treatment option. 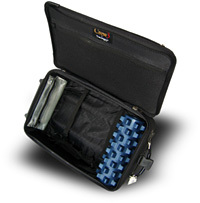 They're convenient, economical, and remarkably more effective than conventional self-massage tools. The smooth, hard surfaces of conventional foam rollers can further compress soft tissue. Rolling on top of them does improve blood flow and tissue flexibility, but the effect is relatively superficial, unless you spend a lot of time rolling. As you roll over the top of the RumbleRoller, the bumps continuously knead the contours of your body, stretching soft tissue (muscle and fascia) in multiple directions. This action erodes trigger points, helps restore flexibility, and brings quick relief to common types of muscular pain. By design, the RumbleRoller's bumps are firmer than muscle tissue, but much softer than bone, so they deflect out of the way if they contact your spine or other bony protrusions. This rocking technique nearly doubles the number of ways you can use a foam roller. It's especially effective for penetrating dense tissue like that of your calves, as well as hard-to-roll areas like your upper lats and even your neck. RumbleRollers are molded from an advanced polymer that has several times the strength and tear resistance of conventional rollers. 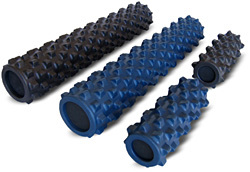 They have a wonderful feel, permanently retain their shape, and are guaranteed to outlast and outperform any foam roller that you've ever tried. RumbleRoller's smooth, nonporous surface repels most dirt. It's also water-proof and latex free, and includes a molded-in antimicrobial additive that helps prevent the growth of bacteria and fungus. To clean your RumbleRoller, simply wipe it down as needed with soap and water or any common household cleaner. RumbleRoller's Beastie Series massage tools expand the RumbleRoller experience to provide more intense, versatile, portable, and affordable massage options. At the heart of this series is an aggressive massage ball called the Beastie. Like the RumbleRoller, the Beastie is available in two versions -- Original (clear) and X-Firm (green). The Original version has firm but very flexible bumps. It's generally your best choice if you're using the Beastie on the floor and putting your full weight on it. The X-Firm is extremely firm, and best for applying pressure by hand or when using the Beastie against a wall. The detachable Base extends the functionality of the Beastie in several ways. First of all, it elevates the Beastie an additional 1/2" which provides better access to some areas of your body, such as your hip flexors, psoas, and pec attachment. It also stabilizes the Beastie in a way that facilitates more controlled massage techniques. And it retains the Beastie for easy use against a wall or within the Beastie Wall System (described further below). The Beastie snaps easily in and out of its Base, but holds firmly while in use. You may have seen other over-the-shoulder back massagers, but none quite like this. This accessory holds a Beastie so that you can easily and effectively massage hard-to-reach areas of your upper back, neck, and shoulders while in a comfortable and relaxed upright position -- even on your couch in front of the TV. 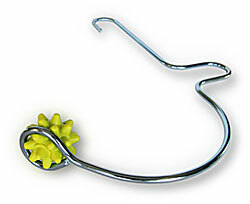 Plus, you can quickly and easily remove the Beastie for use without the Hook. Constructed of solid steel for a lifetime of use. Conventional stick-type massagers aren't practical to use on hard-to-reach areas of your body like your back, shoulders, and arms. And you have to put a LOT of pressure on them to get a good massage. The Beastie Bar was created to overcome these limitations. Instead of the smooth plastic rollers you find on other stick massagers, it uses a pair of Beasties with firm, high-profile bumps. It's the first and only stick-type massager to enable true deep-tissue massage. These wall-mounted systems consist of aluminum guide rails and sets of clamps that provide attachment for Beastie Bases or Beastie Bar Stands. This allows a Beastie or Beastie Bar to be easily positioned at any height along the rails. 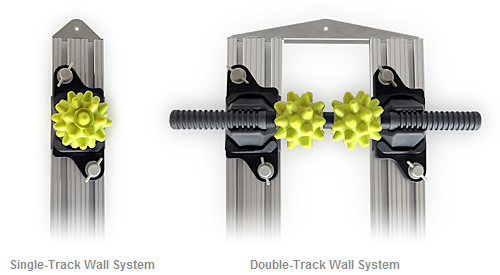 The Single-Track Wall System includes a single set of clamps for mounting one Beastie. If you add a second set of clamps to the Single-Track System, you'll be able to mount a Beastie Bar, but only in a vertical orientation. The Double-Track Wall System includes two sets of clamps, and allows a Beastie Bar to be mounted either vertically or horizontally (as shown above). Jeff Alexander is a certified coach and personal trainer through CrossFit, NASM, ISSA and is a former Marine. He teaches SMR (Self-Myofascial Release) clinics across the USA where participants pay hundreds of dollars to benefit from his advice. This DVD, titled SMR Tips for RumbleRoller and RR Beastie, is like getting a front row seat at a Jeff Alexander clinic at a fraction of the cost. Included are 21 video segments that provide over 3.5 hours of entertaining and detailed SMR instruction using the RumbleRoller and RumbleRoller Beastie massage tools. Below are pricing and current availability for all RumbleRoller massage tools.